Does this still have the same scaling issues as the previous converter? Having previously bought a Super MVS II Converter it had scaling issues with games like Art of Fighting and Samurai Showdown etc. I don't want to buy another product for $238 that has the same issues. Just received mine. No scaling issue this time ! Do i need to update it with the firmware found on the CD ? you don't need update the firmware from CD,it's same with your current one. but we have v2.0 beta firmware solved the AOF2 cheat code issue perfectly (thanks RAZ a lot ), if you want to test please PM me,will mail to you for testing, the final version is coming soon. Is it possible to go the "General Bios Settings" (who normally is in in each unibios) because I would like to configure the number of credits in game(the "Cheat Database" only permit to have unlimited credit". Thanks for your answer. no, you just can select the "unlimited credit" in the magickey cheat code menu. I don't know if a software update is possible to fix them ? i think you need change your SNK ac adapter ,to test again. Can the SNK Super MVS plus 2011 version be updated in any way to perform like this version? I'm just looking to see if the scaling issues can be fixed. I all ready have a Unibios installed on my AES. Hi Dr Neo and any other experts out there. I have a magic key 2013 (blue) version 2 mvs to aes converter that I originally purchased to use with my 161 in 1 multicart. I've been using it with this cart for about 6 months now and it has been working fairly well (there are a few audio issues). 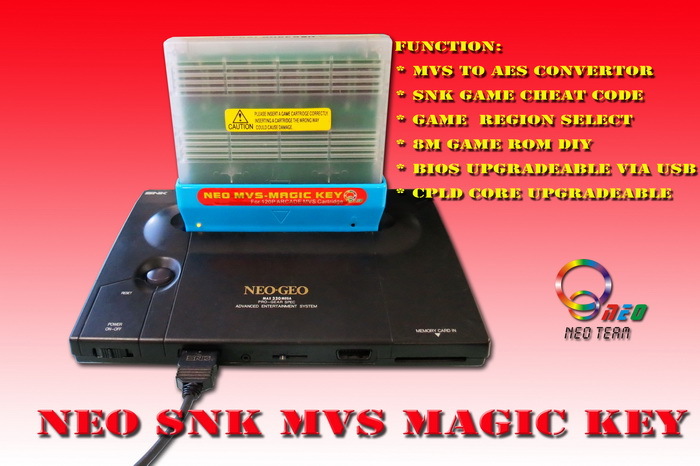 Recently, I purchased two original snk mvs carts to use with it. The carts are Galaxy Fight and Metal Slug 5. Unfortunately neither one of them is working with the Magic Key. With Galaxy Fight the system basically does nothing. I get a completely blank screen. With Metal Slug 5 I get the Neo Geo pro spec splash screen which is completely clear and then it takes me the title screen only it is completely garbelled and the game will not start at all. If I hit the reset button a few times I can see the magic key flash screen which shows I am using version 2.0. Anyway, I don't know what else to do and am looking for help. I have a 1st generation AES (serial 19xxx) and I am using a 5v 3 amp ac adapter. Finally, I had my system moded with composite, s video, and component output. Also, I had the reset button lit up, unibios 3.1 added (which I removed and replaced with the original as part of testing) and a switch added for overclocking (which I never use). Please help! Willza562, you can use NDP to upgrade the core for fix the scaling issues with converter 2011.
foster711, if the 161in1 working with magickey fine, then it's not the magickey issue, you need use alcohol to clean these 2 snk cart's golden finger, i can sure it's the snk cart connection not good to cause this issue. Hi Dr. Neo. Thank you for your reply. Per you suggestion, I took apart each of my three original SNK MVS carts (I recently purchased a copy of Shock Troopers), and cleaned them thoroughly with a pencil eraser and then wiped them clean with alcohol until they shined like brand new. Unfortunately, it made no difference at all. I am having the same exact problems as described before. Is there anything else I can try? I am will to ship the unit to you so you can see the problems first hand. hi foster711, the 161in1 working perfect still ?